In anticipation of our next Real World Sourcing Series expert briefing, 'Evaluating Bids and Tenders', we'd like to offer you the opportunity to access some of the sessions we've previously delivered. Our industry experts (and former CPOs), Guy Allen and Peter Smith have spent some time in the BravoSolution recording studio and these briefings are now available online. Up first is 'Maximising Success from eAuctions', presented by Guy back in 2012 but still as relevant today as it was then, can now be accessed via our newly opened Online Briefing Room. Electronic Auctions are frequently used to deliver cash releasing savings across public and private sector businesses. 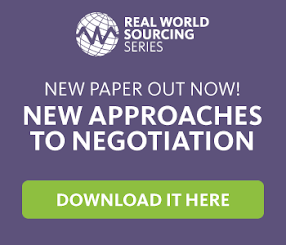 Conducting strategic, web-based negotiations enables buyers to capture multiple revised offers for business, speeding up the negotiation process and promoting competitive behaviour amongst the supply base. Managed well, an eAuction can lead to significant savings, improvements in the supply base and better value purchases. We'll be shortly adding further presentations to our Online Briefing Room, so subscribe here to be kept up to date.